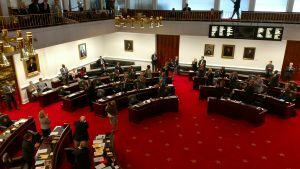 Members of the North Carolina General Assembly yesterday (Feb. 28) marked the 125th anniversary of the first classes to attend The University of North Carolina at Greensboro (UNCG) with statements celebrating the university’s rich history and tradition of providing academic opportunity and excellence to students. Statements were read by Representative Amos Quick and by Senator Gladys Robinson. Founded in 1891, UNCG is one of the original 3 institutions in the UNC system, the oldest public university system in the U.S. Today, it serves more than 19,400 students and employs 2,500 faculty and staff. UNCG is the largest state university in the Piedmont Triad and has an annual economic impact of more than $1 billion. The campus has grown to include 30 residence halls and 30 academic buildings on 210 acres. The university will mark its 125th anniversary with a series of events and activities throughout the 2017-2018 academic year. The University of North Carolina at Greensboro was established by legislative enactment on February 18, 1891. The institution opened on October 5, 1892, with a student body of 198 and a faculty of 15. NOW, THEREFORE, it is important to honor the founders of The University of North Carolina at Greensboro for their vision, commend the University for its contributions to North Carolina and its people, and extend congratulations on the occasion of the institution’s upcoming 125th year celebration. In Witness whereof, the undersigned certifies that the foregoing statement was read in the House and placed upon the Journal on the 28 day of February, 2017. UNCG Libraries will host its Annual Friends of the Libraries Dinner on March 29 at 6 p.m. in Cone Ballroom of the Elliott University Center at UNCG. Tickets are $60 for members and $70 for nonmembers of Friends of the UNCG Libraries. Table sponsorships are available for $650 and include eight tickets, a special pre-reception at 5:15 p.m., preferential seating and recognition at the event. Reservations are required and tickets may be purchased online through Triad Stage or by calling 336-272-0160 of visiting http://purchase.tickets.com/buy/TicketPurchase?orgid=24297&pid=8399027. The deadline to purchase your ticket is March 22. For more information, contact Hollie Stevenson-Parrish at hdsteven@uncg.edu or 336-256-0184. After 20 years in public broadcasting at NPR and PBS, Suarez’s has been the host of NPR’s Talk of the Nation, chief national correspondent for PBS NewsHour and host of Inside Story on Al Jazeera America. Suarez holds a B.A. in African history from New York University and an M.A. in the social sciences from the University of Chicago. He has been awarded honorary doctorates by many colleges and universities, most recently by Lewis and Clark College in Oregon. He is a winner of the Benton Fellowship in Broadcast Journalism at the University of Chicago. He has also been honored with a Distinguished Alumnus Award from NYU, and a Professional Achievement Award from the University of Chicago. A Life Member of the National Association of Hispanic Journalists, Suarez was a founding member of the Chicago Association of Hispanic Journalists. A native of Brooklyn, New York, he lives in Washington, D.C. with his wife and three children. UNC Greensboro takes on ETSU in SoCon basketball action at the Greensboro Coliseum on Monday, February 27, 2017 in Greensboro, North Carolina. What a sweet moment for the UNCG Men’s Basketball players and coaches. With Monday’s big win over East Tennessee State, the Spartans earned the SoCon Tournament top seed. The win moved the Spartans (23-8, 14-4) into a three way-tie atop the standings with ETSU and Furman. By virtue of its 3-1 record against the two teams, UNCG will enter the Southern Conference Tournament this weekend as the No. 1 seed. 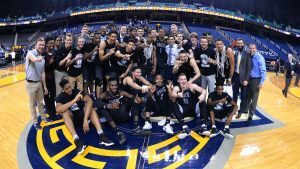 The UNCG men’s basketball team can call itself Southern Conference Champions as the Spartans tied the program-record with their 23rd victory of the season by knocking off previously first-place East Tennessee State 72-66 Monday night in the regular season finale at the Greensboro Coliseum. The victory improves the Spartans to 23-8 overall on the season and 14-4 in SoCon play, moving UNCG into a three-way tie atop the standings. The Spartans enter the SoCon Tournament as the top seed for the first time in program history and will begin play in the quarterfinal round Saturday, playing the winner of No. 8 Western Carolina and No. 9 The Citadel at noon at the U.S. Cellular Center. The championship is the third in program history in SoCon play and the first overall championship as the past two championships were North Division titles in 2001-02 and 2011-12. The 23 victories ties the program-record at the NCAA Division I level with the 1994-95 team while the 14 SoCon wins extends the Spartans’ already program-record. Additionally, the win was the seventh straight for the Spartans, marking their third winning streak of six or more games this year and their second streak of seven games. Want to see them play in the tournament? The UNCG Spartan Club & Alumni Network of the Triad are sponsoring a 2017 SoCon Basketball Road Trip this Saturday, March 4. Join fellow Spartans and guests for a bus trip to Asheville for UNCG’s tournament opener at the U.S. Cellular Center this Saturday at noon. Tickets are $40 and include the bus ride to Asheville with snacks and drinks and a ticket to the game. The bus will make its first stop for a pre-game social. The bus departs UNCG at 7:30 a.m and will arrive back at UNCG at 6 p.m.
Charter bus departs from UNCG campus on Stirling Street, directly in front of Elliott University Center, next to Walker Avenue parking deck. Parking is free in the Walker parking deck. Bus has bathroom facilities and free wifi. Register here! Space is limited. UNCG has been chosen to join 30 other institutions nationwide in a new effort to help close achievement gaps, better prepare students for college and help improve educational outcomes for students who will benefit from additional institutional support. UNCG is now part of the “Frontier Set,” a project funded by the Bill & Melinda Gates Foundation, to identify successful strategies to improve graduation rates, especially for low-income, first generation and students of color. · Launching a “Summer Bridge” program, to be piloted this year, which will help up to 40 students get acclimated to campus life and college curriculum. Students will live on campus at UNCG and take a science or English course as well as a first-year experience course (Foundations for Learning). Their progress will then be tracked and supported steadily throughout their career at UNCG. · Creating the “UNCG Chance” program to support college readiness for Latino and Hispanic students, which will help drive stronger connections between students, their families and the University. This program will include a fully funded 3-day experience on campus over the summer for selected incoming first year students. · Creating a dedicated advising system for selected students, including additional training, support and tools to help better support at risk students at the individual level. Advisors will work with Bridge students and others as needed as the program evolves. · Enhancing digital learning and online tutoring for academically at risk students. This will include the creation of weekly online tutorials, supplemental instruction programs and other uses of technology to better help students manage, learn and succeed in the university environment. The complete AASCU press release is here. You can read about the program in the Greensboro News & Record here. Operationally, these programs will be led by a strong UNCG team with critical roles in bringing these concepts and programs to life, including Dr. Dana Dunn (visionary), Dr. Joseph Green (conductor), Dr. Jodi Pettazzoni (analyzer), Christopher Dunst (analyzer), Dr. Jacquelyn Jones (site team coordinator). For more information, contact Dr. Jones at jrjon25@uncg.edu. Design and construction: What’s happening at McIver Building? A large three-part construction project is underway on campus. ● The demolition of the existing McIver Building will take place in Spring and Summer of 2018. ● And then construction of the new Nursing and Instruction Building on the former McIver Building site will get underway. ● A new South Chiller Plant will be constructed Spring 2018 – Spring 2019, to complement one already on the north side of campus. “We’d plan on having all the demolition work completed before students return in August 2018,” said Matt Takacs, assistant director of design. Rodgers Builders Inc./DPR Construction have been chosen as the construction manager of the project by the Board of Trustees. The design phase for the new Nursing and Instruction building and the new South Chiller Plant has begun, says Scott Noble, design project manager for the university. During the design phase logistic plans will be prepared for the demolition of McIver and construction of the new building in order to attenuate the significant impact of these activities on the campus and adjacent buildings in particular. The demolition of McIver and the construction of the new building will take two years. The School of Nursing will occupy about 50 percent of the new building. Also, the facility will provide teaching and laboratory research space for Biology, Chemistry and Health and Human Sciences as well as classroom space. The south Chiller Plant will provide capacity for the Nursing and Instructional Building and enhance reliability of the entire campus chilled water system. The new plant will help feed chilled water to mechanical units on campus through underground lines, increasing capacity as the amount of campus space that need to be cooled has increased in recent years. This chiller plant will need to be in place before the new Nursing and Instructional Building opens, Noble explains. Preliminary site evaluations such as utility locating, soil borings and land surveys have already been completed at both sites. This information is needed during the design phase for the new buildings. In a future CW: learn more about the offices and programs moving, as a result of this construction project. Learn full details at a site devoted to the project: https://facdc.uncg.edu/nursing/. In September of 1956, JoAnne Smart and Bettye Tillman stepped foot on the campus of Woman’s College, now UNCG, as the institution’s first African American students. Their four years on campus were marked by courage, strength of character and a commitment to pursuing excellence in education, despite the challenges they faced. The following are highlights from a recent interview with JoAnne Smart Drane at her home in Raleigh. Tell us about your time at Woman’s College. What were some of your favorite moments, and what challenges did you face? I was the first person in my family to ever go to college. I had never attended school with any white people, and I had not had any white teachers. But I always knew that I wanted to go to college, and I had the hope that things would go smoothly. I think that our feelings, at least initially, bordered on fear of the unknown. Bettye and I weren’t sure how we would be received and what the attitudes of the students would be. In many cases, students were receiving and accepting. On the other hand, there were students who were very hostile in their interactions. I think one of the things that was so helpful to the African American students who were at Woman’s College at the time was the fact that the black community in Greensboro was so supportive and encouraging. I also think of the opportunities that I would not have had otherwise. The university brought in a lot of cultural activities – theater and music and speakers that were very, very important in the overall development of a student. Where did life take you after you graduated in 1960? I started my professional career as a guidance counselor in a junior high school in Rocky Mount. I was there for a couple years before I returned to Raleigh, which is where I’m originally from, and accepted the position of psychometrist in the central office of Raleigh City Schools. In that role, I was responsible for administering the standardized testing program. From that, I moved on to being the director of programs for exceptional children. That was a very exciting and very challenging period of my career. I left that role after several years to work in the state department of education. I stayed there until being offered a position to come back to work with the newly merged Raleigh and Wake County schools, and I accepted a position as the director of federal programs, which led to my becoming the assistant to the superintendent. I then worked again in state government as a consultant in teacher education, which is the position I retired from. So my career has spanned a lot of different roles in the education sphere, but roles that allowed me to use a lot of the learnings and skills that I acquired as a student from Woman’s College and later from my graduate work. You’ve stayed involved with the university in a variety of ways, including serving on the Board of Trustees. Why have you felt compelled to stay connected to UNCG? My first connection after graduation was some 20 years later, when I received an invitation from the Neo-Black Society to come and speak to a group of alumni who were interested in my experiences at Woman’s College. Until that time, I really had no desire to go back. But once I got back and saw that there was an interest – and then also saw how the university had grown in its acceptance and the involvement of African American students and faculty – it opened my eyes to the kinds of things that had developed in that period of time since I had left. It was from that experience that I began to become more interested and more involved. I accepted the nomination to be a representative on the alumni board, and from that it just seemed to grow. How does it feel to know that you were a trailblazer for the rich diversity we see on campus now? It’s amazing to see the diversity that the campus exemplifies today compared to when we were there some 60 years ago. It’s heartwarming and humbling to think that some small part of what’s happened today can be traced back to two young black women who stepped on that campus in 1956. What’s your vision for UNCG? Where do you want to see the university in five years? Woman’s College had the reputation of being a school with strong academics and good, solid preparation for professionals and for life in general. I think that reputation has continued. I want UNCG to be known as the very best of all of the constituent schools in the university system, and I think it will be. I’m excited about the new chancellor and the different areas that the university is getting recognition for. The excellence of the university is something that needs to be continued and supported – not only by the state government that provides the finances, but also by alumni. That support is very important to continue the tradition of excellence. JoAnne Smart Drane’s story was highlighted in a full-page ad, seen above, that appeared in the Greensboro News & Record, Raleigh News & Observer and Charlotte Observer on Sunday, Feb. 26, in celebration of Black History Month. Faculty Senate meets Wednesday, March 1, at 3 p.m. in the Virginia Dare Room of the Alumni House. Welcome and remarks will be provided by Anna Wallace, faculty senate chair, and minutes will be delivered by Brad Johnson, Faculty Senate secretary. At 3:15 Provost and Executive Vice Chancellor Dana Dunn will deliver remarks and take questions, followed by Jeff Shafer, associate vice chancellor and chief communications officer, who will also give remarks and take questions. Greg Bell, government committee chair and Senate liaison will speak on the resolution on changes to the promotion and tenure regulations on assistant professor and professor hires, and the resolution on changes to the GEC chair election. At 4:25, David Teachout, director of Undergraduate Teaching and Learning Commons and Carl Lashley, faculty senator, will make a presentation concerning student ratings of instruction, and there will be an opportunity for discussion. At 4:45 Stoel Burrowes, elections committee chair will give a Senate apportionment follow-up report. His report will be followed by announcements. The next meeting of the Faculty Senate will be Wednesday, April 5, at 3 p.m. in the Virginia Dare Room of the Alumni House, Virginia Dare Room. It’s this unique combination of skills that makes humanities majors well positioned to enter the 21st-century job market. But often, students don’t know how to best communicate these skills to prospective employers. The solution? “The Liberal Arts Advantage: Launching from Campus to Career,” a professional development workshop hosted by UNCG’s Humanities Network and Consortium (HNAC) and Career Services Center. The free event – held on Friday, March 3, from 9 a.m. to 2 p.m. in Cone Ballroom in the Elliott University Center – will include a keynote address by senior vice president at Bank of America Laurin Titus, spoken word poetry by PhD candidate Donovan Livingston and several breakout sessions. A free lunch will be provided. While “The Liberal Arts Advantage” is designed specifically for undergraduates majoring or minoring in a humanities discipline, such as English, history or philosophy, all undergraduate students in the College of Arts & Sciences are welcome to attend. Students must register online by Monday, Feb. 27. The event is sponsored by the College of Arts & Sciences, HNAC and the Career Services Center. For more information and to register, visit hnac.uncg.edu/laa. To learn more about HNAC and upcoming events, click here. “Memory across time: From neurons to life stories” will be the theme of the 2017 Kendon Smith Lecture Series, presented by the UNCG Department of Psychology. The series will feature Dr. Howard Eichenbaum (Boston University), Dr. Thomas Lyon (University of Southern California), Dr. Elaine Reese (University of Otago, New Zealand), and Dr. Daniel Schacter (Harvard University). The organizer is Dr. Jeni Pathman. The series will be held at the EUC and School of Education Building. Lecture attendance is free and open to the public. The Kendon Smith Lecture Series is an endowed annual event that brings international experts to the UNCG campus to discuss specific themes in psychology that are of interest to the academic community and the public. The full schedule may be seen at https://psy.uncg.edu/2848-2/. UNCG Speech and Hearing Center is hosting a special presentation on Brain Hearing. Please join the staff as they welcome Ellen Williams, Au.D., F-AAA from Oticon, Inc., on Thursday, March 16, 2017, from 10 a.m.-noon. Your brain works at incredible speeds to process sound. Learn how you can enjoy a more effortless, natural hearing experience. Call to reserve your spot today, at 336-334-5939. The UNCG Speech and Hearing Center is located at 300 Ferguson Bldg., 524 Highland Avenue. The Department of Specialized Education Services (SES) was well represented at the annual conference of the Association of College Educators – Deaf and Hard of Hearing (ACE-DHH). Professions in Deafness faculty Drs. Jon Henner (Assistant Professor) and Claudia Pagliaro (Professor) presented along with SES doctoral student, Sulaiman Adeoye, who also gave a presentation with a fellow doctoral student from the University of Tennessee, Knoxville. In addition, Dr. Pagliaro co-presented on collaborative research with SES doctoral student Taylor Hallenbeck, and with SES doctoral student Kimberly Hutter. ACE-DHH is the premier association for teacher preparation and research in Deaf Education and related areas in the U.S. and Canada. The RISE Networking event “Three Faces of IUSE: Ideas for the future of undergraduate science education” will be held next week. Join RISE as they welcome IUSE (Improving Undergraduate STEM Education) grant awardees Jen Rhode from UNC Asheville (Biology), Bill Gerace from UNC Greensboro (Physics), and Marian Franks (Chemistry) from NC A&T University. The event is Wednesday, March 8, from 11:30-1:30 pm in the School of Education Building. 401. On Tuesday, March 7, UNCG will present a performance of “Tikvah,” a multimedia piece by Burton Beerman, that includes a chorus, narrator, saxophone quartet, dance and video, based on the memoir of Holocaust survivor and Torah scholar Philip Markowicz. This performance is part of UNCG’s yearlong War and Peace Imagined series. The UNCG Chamber singers, directed by Welborn Young, will perform with vocalist Lindsay Kesselman, narrator Rabbi Fred Guttman and the Red Clay Saxophone Quartet. This show has been choreographed by Brianna Taylor and Emily Elizabeth Aiken in collaboration with dancers, and there will be a special appearance by Celesta Haraszti. Anton Jessberger is the interactive video designer and David Holley has coordinated the production. The performance starts at 7:30 p.m. in UNCG Auditorium and is free and open to the public. This summer the North Carolina Museum of Art (NCMA) in Raleigh will open a new, expanded African art gallery, and UNCG art history professor Dr. Elizabeth Perrill serves as the consulting curator, playing a large role in the gallery’s overall design. The expanded gallery, to be located in the museum’s East Building, will include maps that reveal the geographic origins of diverse African artistic traditions and themes that span 16 centuries. It will feature ceramics, textiles, jewelry, metal works, wooden sculptures and architectural details, and includes 109 pieces that have never been seen before in a public exhibition or have not been exhibited in decades. The East Building African Art Gallery will hold pieces from more than 25 African countries, as well as artists working in the global African Diaspora. Perrill and the museum staff have designed the layout especially with audience education in mind. They examined the design of over a dozen national museums, and they also conducted audience research to determine groupings and terminology that would invite rather than intimidate museum-goers. Their plan provides a geographical orientation for the viewer, dividing the artifacts into five general regions (Northern, Western, Central, Eastern, and Southern) and also grouping them by theme, such as “Golden Regalia,” and “Geometry and Abstraction.” The regions will be joined centrally by a masquerade platform which will hold objects and fully-reconstructed costumes used in masquerades in several regions. The gallery also includes a two-story space for contemporary African art. Perrill is especially looking forward to the more ephemeral parts of the gallery—for example, headdresses, masks, and other delicate objects which are able to be on display only because of the greater environmental control available for the new space. “The good thing about this new space is that it can go to even lower light levels—there’s a lot more for opportunity for control in the new space,” she said. As one of the most ephemeral and contemporary parts of the gallery, June 5 through 8, Nigerian-born and D.C.-based artist Victor Ekpuk will, over the course of a week, create a 30 by 18 foot chalk mural which will be on display for a year. While the mural is up, immigrants and refugees from Africa who now live in North Carolina will be invited to a lunch and conversation about the piece, and they will also be invited to participate in the clearing of the mural the following year, an act similar to many spiritually significant moments in many African cultural traditions. Another part of the gallery that Perrill cites as especially meaningful will be the North Carolina Collector’s Wall, a space that will display pieces from North Carolina collections. The first pieces that will occupy the space are from the Bennett College collection, made up of pieces directly from the family that founded the Smithsonian National Museum of African Art. After those items are rotated to storage, they will be replaced by other pieces procured from North Carolina institutions or private collections. Read more about how Perrill has curated the new NCMA African art gallery, and how she shares that experience with UNCG students here. Artist’s rendering of the future art gallery courtesy NCMA. The Alumni House will begin accepting reservations for the 2017-18 academic/fiscal year on Wednesday, March 1, 2017 at 8:00 a.m. All reservation requests should be made online via the Alumni House web page. For a list of revised rental/usage policies, rates & fees, and a link to the reservation form visit the web page at http://alumni.uncg.edu/house. For additional information, contact John Comer at 6-1466. Dr. Laurie Gold (Kinesiology) received additional funding from the National Institutes of Health for the project “Pathways from Childhood Self-Regulation to Cardiovascular Risk in Adolescence.” Cardiovascular risk factors (CVR)—including obesity, elevated lipids, altered glucose metabolism, hypertension, and elevated low-grade inflammation—are detectable, common, and increasing during adolescence. However, the developmental origins of adolescent CVR and its increases are poorly understood. The project will test whether childhood self-regulation and adolescent cardiovascular risk factor pathways are mediated by health behaviors (e.g., substance use, exercise, nutrition, and sleep). By testing these linkages, the proposed research will be the first to conduct a fine-grained developmental analysis of childhood self-regulation health behaviors and CVR pathways spanning 16 years. Vascular inflammation and its subsequent endothelial dysfunction play a fundamental role in the initiation and progression of atherosclerosis. Accumulating evidence shows that various pro-inflammatory cytokines including tumor necrosis factor (TNF)-a, interleukin 1 beta (IL-1ß) and interferon (INF)-? are critically involved in the pathogenesis of atherosclerosis. An elevated blood level of these pro-inflammatory mediators is validated markers of vascular inflammation, which can subsequently lead to the development of atherosclerosis. The overall objective of this project is to evaluate the cellular mechanism(s) of action of genistein in its protective effect against cytokine-induced vascular dysfunction. Tourism is a major contributor to the overall economy in Greensboro with an estimated economic impact of $1.2 billion in 2013. The tourism industry is directly accountable for 12,450 jobs in Guilford County. The purpose of the project is to gain a better understanding of two vital markets to the Greensboro tourism industry: the Leisure market and the Conference market, with the Conference market being made up of two groups – conference planners and conference delegates (attendees). Space is limited so please RSVP which session you would like to attend by emailing hgkiss@uncg.edu. UNCG sociology professor Dr. Saundra Westervelt views Lucinda Devlin’s “Omega Suites” photographs in the Weatherspoon Art Museum with an inroad to their significance. She’s a leading researcher on death row exonerees, and she’ll speak about the photographs in a special event in the gallery on March 2. The photographs from Devlin’s most celebrated collection show empty, clean execution chambers, each with a distinct personality. Westervelt has known people who have lived near them for 20 or more years, before they were proven innocent and released from death row. Westervelt and her colleague Dr. Kim Cook (UNCW) compile the stories of innocent people who have been convicted of capital crimes, incarcerated on death row and later released because of their factual innocence. Together, they have interviewed many exonerees and written extensively about the challenges they face in “Life after Death Row: Exonerees’ Search for Identity and Community,” published by Rutgers University Press. Westervelt is also co-editor of a collection of essays, “Wrongly Convicted: Perspectives on Failed Justice” and an edition of the Albany Law Review dedicated specifically to the aftermath issues experienced by exonerated death row survivors. Before she began her research, little was known about the lives of exonerees after prison, and few resources were available to them. Through her research, she knew Walter McMillan, one subject of “Just Mercy,” an award-winning memoir by attorney Bryan Stevenson. Recently, Westervelt has led discussions on Stevenson’s work at a Friends of the UNCG Libraries event and at Scuppernong Books. “He was put on death row before he was even convicted,” she shares about Walter McMillan, who lived in close proximity to Yellow Mama for six years, and expected to end his life there, she says. Westervelt also counts among her close friends Kirk Bloodsworth, the first death row DNA exoneree in the entire United States. Following his exoneration, Bloodsworth worked with Congress to pass the Innocence Protection Act of 2003, and established the Kirk Bloodsworth Post-conviction DNA Testing Program, to protect other innocent people. “Innocence is a very powerful thing,” Westervelt says, explaining that a high number of death row exonerees has led to the banning of the death penalty in some states, such as Illinois. In all the photographs of the immaculately clean execution chambers, Westervelt notices Devlin revealing “the attempt to sanitize it.” But the many exonerees Westervelt has interviewed would say it’s not possible. Westervelt is vice chair of the board of Witness to Innocence, the only national organization whose members are solely death row exonerees, and she will attend the annual conference in April. She explains that the “Innocence Movement” took shape in the late nineties and early 2000s. “The more that those cases became public, it made people think twice.” As public awareness increased, the United States’ use of the death penalty began to decline, after the height of its use in the late 1990s. Currently, 31 states have a death row, including most of those shown in Devlin’s photographs. Westervelt is now gathering data on North Carolina exonerees, studying reparations, compensations and lawsuits. She also is working with a sociology graduate student, Tiffany Merritt, to gather information on the reparations received by all 157 death row exonerees in the U.S. One thing she has found that exonerees rarely get: an apology. Westervelt will speak on Devlin’s “Omega Suites: The Architecture of Capital Punishment” this Thursday, March 2, at 6 p.m. in the Bob & Lissa Shelley McDowell Gallery at the Weatherspoon Art Museum. Visiting artist Narisu Bao taught UNCG music students Mongolian throat singing this month. Narisu and the students will present a recital of Mongolian throat singing Monday, Feb. 27, 7:30 p.m., in the UNCG Music Building’s Recital Hall. Read more about Narisu here and here. UNCG art history professor Elizabeth Perrill’s courses in African art often start with the oldest symbolic objects ever created by human beings. They may span 750 centuries, and 54 countries, within a continent more than three times the size of the United States. Perrill is a Zulu ceramic specialist, but her overall knowledge of African art goes far beyond her specific research area. Her museum training and curatorial work at the Metropolitan Museum of Art, the Des Moines Art Center, the Faulconer Gallery of Art and the New Taipei City Yingge Ceramics Museum has led her to become a major force behind the planning and upcoming opening of a brand new African art gallery in the North Carolina Museum of Art (NCMA.) As consulting curator, she has been at work on a thorough plan for the new gallery, which will be three times as large as the current one and display almost twice as many works, including many newly acquired pieces purchased or donated during her time as consulting curator. For a collection such as that of the NCMA, Perrill has to determine which objects are museum-worthy. They must be exemplary for the type of work they are, formally and aesthetically the best. “More than anything you’re trying to show the aesthetic norms and best version of that art work from the culture it came from,” says Perrill. The expert knowledge that Perrill has developed to make those decisions is something UNCG students can benefit from, in tremendous ways. Last spring, her African art history students were able to gain curatorial and conservation experience by working with objects from the newly gifted Warren M. Robbins and Lydia Pucinelli Collections at Bennett College. The students completed detailed condition reports about each object. They also became aware of each object’s provenance, or object history—what country it came from, who or which cultural tradition made it, how it was made, and any history available about its owners following its creation—details that establish the legitimacy and value of art objects for any part of the world. Provenance histories are crucial for works of art in museums like the NCMA. The African pieces that have been acquired come from a variety of sources—international galleries, private collections, or even the attic of a Greensboro resident with a great uncle who was part of the South African Gold Rush of 1885. Perrill says that Greensboro connection yielded some of the best pieces added to the NCMA collection during the past five years, such as a headrest and a snuff container. She hopes these works will be featured in the North Carolina Collections Wall in the new African reinstallation at NCMA. Preparing museum objects for an exhibition was something Perrill herself experienced in a college course, and she wanted to give that valuable experience of art history research training to her own students. Bennett’s collection provided the perfect opportunity. One of the most challenging tasks Perrill had her students perform was to write wall texts describing the pieces. Perrill has been working with the North Carolina Museum of Art since 2012, when she began helping with exhibition rotations and African art acquisitions proposals. In 2015, when the museum received a grant from the William R. Kenan, Jr. Charitable Trust, she became a full-fledged consulting curator. She has been requested to write and will soon publish an exhibition preview of the gallery in African Arts, the lead journal in her field. Next week: A detailed look at Perrill’s work on the new NCMA African art gallery, opening this summer. Visual: Perrill shows a design component of the new gallery space. This semester UNCG Music’s artist-in-residence from China, Narisu Bao, presents a distinct talent: Khoomei, which is Mongolian throat singing. He will give a concert at UNCG next Monday, Feb. 27, and in the meantime he’s sharing his talent with music students by teaching them the techniques of throat singing. The students who have been practicing with Narisu will perform traditional Khoomei folk songs with him in the concert, showing off their new skill. Narisu is a Mongolian native who teaches at the Inner Mongolia University of the Nationalities. He established a Khoomei ensemble called “Sound of Heaven,” which performs in Inner Mongolia and in other provinces of China. The concert is Monday, Feb. 27, 7:30 p.m. in the Recital Hall of the Music Building. It is free and open to the public. Visual: Narisu (right) teaches a class. See the video below of Narisu’s recent work with UNCG music students. The women’s team won their final home game, last weekend. They are currently 16-12, and 7-6 in the conference. For basketball ticket information, click here. Verdi’s Requiem will be performed Friday, Feb. 24, 7:30 p.m. in UNCG Auditorium. Featured performers include Jill Bowen Gardner, soprano; Stephanie Foley Davis, mezzo-soprano; Daniel Stein, tenor; and David Weigel, bass. The UNCG Symphony Orchestra will be joined by the UNCG Chamber Singers, University Chorale, Women’s Choir, and Glee Clubs. Verdi’s monumental Requiem is both a memorial for the dead and a plea for consolation of the living. This special performance will combine the powerful music with digital artwork created by UNCG Art students. Verdi’s Requiem is one of the most significant and moving works in the repertoire, and this performance is not to be missed. A pre-concert lecture will tie Verdi’s masterpiece to his biography and the struggle for Italian Nationalism. Post updated Feb. 24, revising information about the digital art. On February 16, UNCG’s Bryan School hosted the Triad Business Journal’s 2017 “40 under Forty” awards event and ten Spartans were honored for their accomplishments in professions, industries and communities. After five years and three deployments with the Marines, Freeman in 2014 joined Ameriprise, only two days after completing his active duty. He was pivotal last year as the firm transitioned into an Ameriprise franchise, Barn Ridge Financial Partners, ensuring a seamless shift for the firm’s 200 clients, 575 individual accounts and some $62.5 million in assets under management. Now 26, he is president of the UNCG Student Veterans Association and serves with the N.C. Entrepreneurship Centers GEMS Program that mentors aspiring entrepreneurs. Upon the exit of the High Point chamber’s CEO two years ago, Gauldin stepped up to lead the organization through a challenging transition and merger and has since been instrumental in the growth and success of Business High Point. Now 34, she has helped lead strategic efforts and fundraising at numerous community organizations, including the High Point Market Authority, board of visitors at High Point University, the board of Laurel University and the High Point Food Alliance. Hester, 35, leads the BOSS program that supports students who are either first-generation college students, have disabilities or are from low-income families. He’s also a personal trainer who, after losing 81 pounds in eight months, has authored 10 motivational books. Mearing, 29, has used her understanding of digital media to boost marketing reach wherever she serves. At Bank of Oak Ridge, she’s led branding for implementation of new interactive teller machines and managed the “ME Banking” social media promotion. As a community volunteer, she donated more than 500 hours to direct the 9/11 National Day of Service in Greensboro, coordinating 80 nonprofits, 40 corporate sponsors, 22 media outlets and training 450 volunteers. Murray, 38, joined Truliant in 2009 without a college degree and is now one of the youngest vice presidents in the credit union’s history. He supervises more than 260 professionals and 32 branches and has been key in guiding Truliant’s 10 branch Charlotte expansion. A foster parent to four children, he’s also engaged in the community, raising nearly $10,000 for Second Harvest Food Bank. An assistant city manager since 2013, Parrish, 38, oversees engineering and inspections, field operations, transportation, water, fire and Guilford Metro 911 operations, as well as working with development services and Minority and Women’s Business Enterprise functions. He serves on the board with the Guilford County Partnership for Children, is a youth sports coach and a volunteer with Samaritan’s Purse and Operation Christmas Child. Raper, 33, leads marketing, fundraising and business development activities, helping lead the nonprofit to 26 percent growth in revenues and the number of students served from about 11,000 to more than 16,000. She founded the UNC-Greensboro chapter of the National Association of Women MBAs and also serves on the Bryan School advisory board. Roberts, 36, leads tourism efforts that have helped tourism expenditures surge from $66 million to $117 million during her 12 years there. She is also a leader in the industry, locally and at the state level, including serving on the N.C. Travel & Tourism Board, the Piedmont Triad Film Commission and with the Blue Ridge Parkway. Co-owner and creative director, Geeksboro Coffee and Beverage Co.
Scott, 36, transitioned Geeksboro from a coffeehouse and independent theater into a multifaceted event space that has since 2012 hosted hundreds of events for local creative communities. In the past year, he also launched the Superfamous Nintendo-fandom convention that brought 2,000 people downtown. Tarleton, 37, is highly regarded for his success in representing clients on tax, business, trust and estate issues. For example, he successfully defended a client when the IRS reduced his conservation easement deduction by 75 percent, ultimately saving the client millions of dollars in taxes. In the community, he’s served since 2011 with the Green Hill Center for N.C. Art, and has served on the board of the nonprofit Ten Thousand Villages. Read more about the “40 under Forty” program and view the slideshow of recipients here. Biographical copy drawn from Triad Business Journal. Photo courtesy Triad Business Journal. This month’s Sustainability Series film will be the award-winning “Landfill Harmonic,” which follows the Recycled Orchestra of Cateura, a Paraguayan musical group that plays instruments made entirely out of garbage. When their story goes viral, the orchestra is catapulted into the global spotlight. Under the guidance of idealistic music director Favio Chavez, the orchestra must navigate a strange new world of arenas and sold-out concerts. However, when a natural disaster strikes their community, Favio must find a way to keep the orchestra intact and provide a source of hope for their town. The film will be shown Thursday, Feb. 23, at 6:30 in Ferguson 100, and will be followed by a discussion, as usual. See the trailer here. Copy drawn from “Landfill Harmonic” website. Dr. Laurie Gold (Kinesiology) received additional funding from the National Institutes of Health (NIH) for the project “Pathways from Childhood Self-Regulation to Cardiovascular Risk in Adolescence. Cardiovascular risk factors (CVR)—including obesity, elevated lipids, altered glucose metabolism, hypertension, and elevated low-grade inflammation—are detectable, common, and increasing during adolescence. However, the developmental origins of adolescent CVR and its increases are poorly understood. This funding will expand and enhance the ongoing longitudinal study through the examination of past and current measures plus additional metabolic (e.g., blood lipids, fasting glucose, insulin) and for building a larger program of research on early self-regulation and its implications for disease risk during the early life course. Dr. Maryanne Perrin (Nutrition) received new funding from East Carolina University (ECU) for the project “Vegetarian Nutrition Dietetic Practice Group Research Grant Award.” Individuals consuming a vegetarian or vegan diet are at risk of having inadequate intake of B-12, eicosapentaenoic acid (EPA) and docosahexaenoic acid (DHA) due to dietary restriction. These in turn may lead to low levels of Brain Derived Neutotrophic Factor (BDNF), a protein that promotes the growth and development of nerve cells. Evidence suggests that the breast milk from women consuming a vegetarian diet is lower in the essential vitamin, B-12, than the breast milk of women consuming an omnivorous diet. This project will assess B-12, EPA, DHA, and BDNF in the breast milk of women consuming a vegan (n=25), vegetarians (n=25), and unrestricted diet (n=25) to help inform dietary advice given to lactating women. Dr. Dianne Welsh, Hayes Distinguished Professor in Entrepreneurship, was inducted as a Fellow in the Small Business Institute (SBI) at the annual meeting February 16. In an additional piece of news from the meeting, Randy Roof, Kristoffer Holm, Guadalupe Rodriguez, Joe Rotondi and Amani Duke, students in the ENT/BUS 300 Feasibility Analysis class at UNCG, won First place nationally for their feasibility analysis plan of Oden Brothers Brewery. Dianne Welsh is the Project Director and SBI Director for the project. Faculty and staff are invited to nominate outstanding juniors and seniors for UNCG’s Golden Chain Honor Society, which was organized in 1948 to recognize students who have made significant and meaningful contributions to the university community. “Golden” denotes excellence and rarity, and “chain” signifies linkage – a binding together of past generations of students who served the University with students of today and those generations yet to come. The organization is unique to the UNC Greensboro campus. Members embody the characteristics of: leadership, scholarship, service, tolerance, judgement, magnanimity and character. Golden Chain is now accepting applications for Spring 2017 inductions. Candidates must be juniors or seniors with a minimum 3.25 GPA. The nomination form and instructions can be found at http://sa.uncg.edu/golden-chain-3/ and should be returned to Coretta Walker at crwalke5@uncg.edu by March 15, 2017. Nominations may be submitted by faculty, staff, Golden Chain alumni, and honorary members. (Please note that accepted students must pay a $20 induction fee). Exciting new developments are on the horizon affecting Adobe Creative Cloud Software and campus-wide printing. By pooling resources from the Provost, Information Technology Services (ITS), and other departments on campus who were already purchasing their own licensing for Adobe Creative Cloud, UNCG will be able to offer the Creative Cloud suite on all university-owned computers (both Macs and PCs). Faculty and staff will also be able to install the software on a “work-at-home” computer. This use of resources is not only more cost effective, saving over 80% on standard pricing, it allows us to continue widespread use of this industry-standard software suite for students, faculty and staff. Adobe Creative Cloud also includes licenses for Acrobat Pro. Restrictions on usage will no longer be enforced after the switch to Creative Cloud. More information will be made available as plans are finalized. Visit Get Adobe for the latest on Adobe Creative Cloud licensing at UNCG. Pharos managed print software delivers a robust printing solution that enables location-independent printing from a variety of devices (laptops, tablets and smartphones). Some departments already use Pharos for printing. We are adopting the Pharos solution campus-wide, improving access to printing and printer security for all students, faculty and staff. ITS expects departments to be able to migrate to the new printing environment beginning in April.